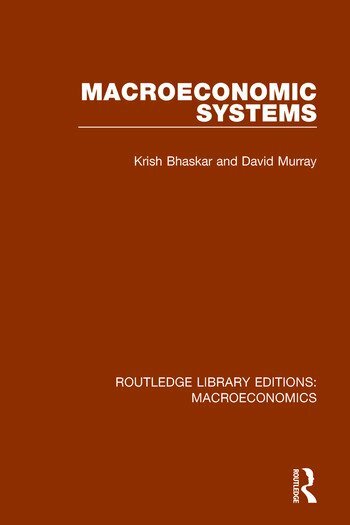 This volume, originally published in 1976, creates a basis from which the specialist topics of macroeconomics can be approached. The first section deals exclusively with a simple classical and Keynesian model within a single common framework to facilitate easy comparison. Although simple models, they provide a sound starting point for the more advanced ideas which make up the second part of the book. Recognizing tht one of the crucial purposes of macroeconomics is to provide advice for central government policy makers, the policy implications of the models are discussed. Part 1: Introduction and Historical Perspective 1. Models and Analytical Techniques 2. The Framework of a Macro Model 3. Macroeconomic Policy 4. The Classical System 5. The Keynesian ISLM System Appendix 6. The Full Keynesian System 7. Keynes and the Classics 8. Keynes and the Keynesians. Mathematical Appendix. Part 2: Introduction 9. The Consumption Decision. Mathematical Appendix 10. The Investment Decision 11. The Demand for Money 12. The Supply of Money 13. The New Monetarism 14. The Labour Market. Appendix. 15. Inflation 16. Foreign Trade 17. Introductory Dynamic Analysis.